In the early years of Erie, Pennsylvania's existence, when one died, they were buried on land belonging to their church or family. Until the 1830s, this was common throughout the United States. The opening of the Erie Cemetery in the mid-19th century changed that for the city. Tucked between Cherry and Chestnut Streets within Little Italy, the cemetery now encompasses 75 sprawling city acres — and while cemeteries are often used as settings in horror movies and ghostly campfire tales, a walk through the cemetery is notably peaceful and anything but morbid. Trees and shrubbery adorn the pathways providing ample shade. People walk the grounds quietly, some there to enjoy the serenity, some to take in the history, others to pay visit to or memorialize a loved one. It's operated by the Erie Cemetery Association, which also oversees the Wintergreen Gorge and Laurel Hill cemeteries. They keep the grounds pristine year-round. Over 50,000 people are now interred there and they still perform over 100 burials each year. "A cemetery is neither a park nor a playground," the association explains on their website. "Cemeteries hold the remains of people we knew and loved. They hold our past … There are heroes and villains buried here, famous people, unknown people, veterans, musicians, fishermen, steamfitters and teachers. There are elderly people resting here and infants who lived only a day. Each of these people had a life and a story." The cemetery originally opened in the spring of 1851, its creation inspired by the growing rural cemetery movement, designed to move graveyards away from population centers. Churchyard and family graveyards were increasingly becoming overcrowded and unsanitary — and, of course, plagued by superstition. Keith Eggener, who wrote a book on cemeteries, explains in an interview with The Atlantic how small plot cemeteries were increasingly becoming public health hazards. "[They were] seen as inadequate, dangerous, crowded, expensive to maintain, and as carriers of disease," Eggener explains. "You often had burials five or six coffins deep. Sometimes the walls would break down during floods — it was actually rather horrible … During times of epidemics — yellow fever, cholera — cemeteries were seen as centers for the gathering of these diseases and their dissemination." 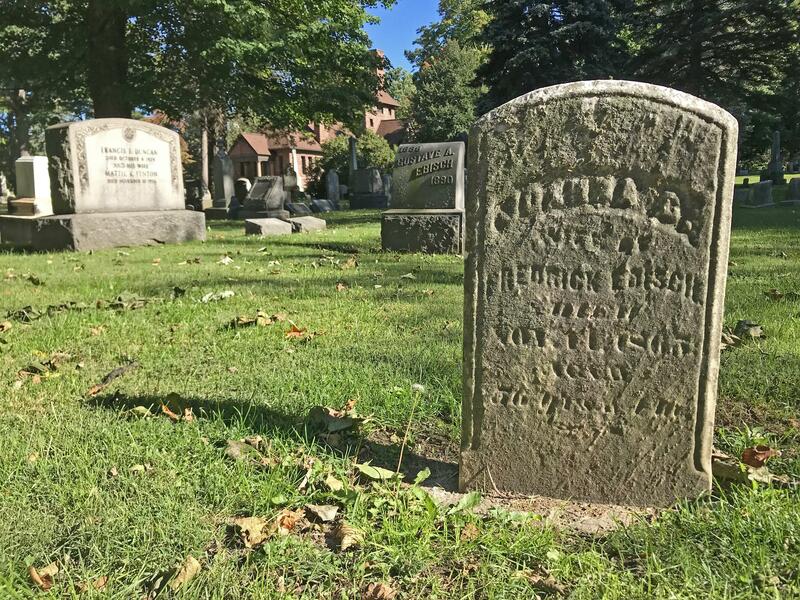 According to a 1903 history on the cemetery, numerous Erie citizens (which included prominent Erie surnames such as Reed, Himrod, Vincent, Tracy, Sterrett, and more) pooled together funds in the 1840s to purchase land for a new public cemetery. It would be designed to "prevent the evils" of having cemeteries so close to homesteads and would be for the good of the public — never profit. At the time, the land was an unoccupied hillside woods, populated only with massive oaks, maples, birches, and spruces, and with one small grassed corner open to natural light. They hired a lawyer named H. Daniels to survey and lay out the grounds. He was assisted by a civil engineer named Samuel Low, a "man of remarkable energy and noble attainments" who would go on to become the cemetery's first superintendent (and the man from which Lowville, just north of Wattsburg, received its name). Soon, interred within the cemetery grounds were some of the city's most prominent residents. Many chose to have constructed vast mausoleums and intricately designed gravestones on their family's plots. After the Civil War erupted and Erie residents died on the battlefields, there were numerous public military funerals, including those of General Strong Vincent, Captain John M. Sell, and Colonel John W. McLane (who was posthumously promoted to General in 1961). Vincent and Sell had ceremonies that began at St. Paul's Episcopal where their lives and sacrifices during the war were celebrated with "much funeral pomp and real grief." McLane, after his body was recovered from the Virginia battlefield where he fell, was equally honored with "impressive services" at the First Presbyterian Church, which concluded with his interment at the cemetery. Resting within the cemetery are many more of Erie's most recognizable historical names, a "who's who" of the city's early history: Daniel Dobbins, Sarah Reed, Harry T. Burleigh, P.S.V. Hamot, Judah Colt, William Himrod, the Tracys, the Sterretts, the Scotts, and the Strongs. The earliest cemetery ceremonies followed a similar predictable pattern of lowering a plain coffin, followed by the minister reciting the traditional: "Earth to earth, ashes to ashes, dust to dust." By the turn of the century though, the cemetery ceremonies had transformed into something more ornate, with more decorative coffins and graveside services adorned with fabrics, flowers, carpets, and awnings. Around this same time, laws were passed in Pennsylvania to criminalize grave robbing and vandalism. An 1855 law stated that if "any person shall open any tomb or grave in any cemetery ... without the consent of the owners or trustees of such grounds ... [they] shall be sentenced to undergo an imprisonment in the county jail or penitentiary for a term of not less than one year." Another law passed in 1860 read that if a person was to "willfully and maliciously destroy, mutilate, deface, injure or remove any tomb" they would also be sentenced to imprisonment and a fine of $100. 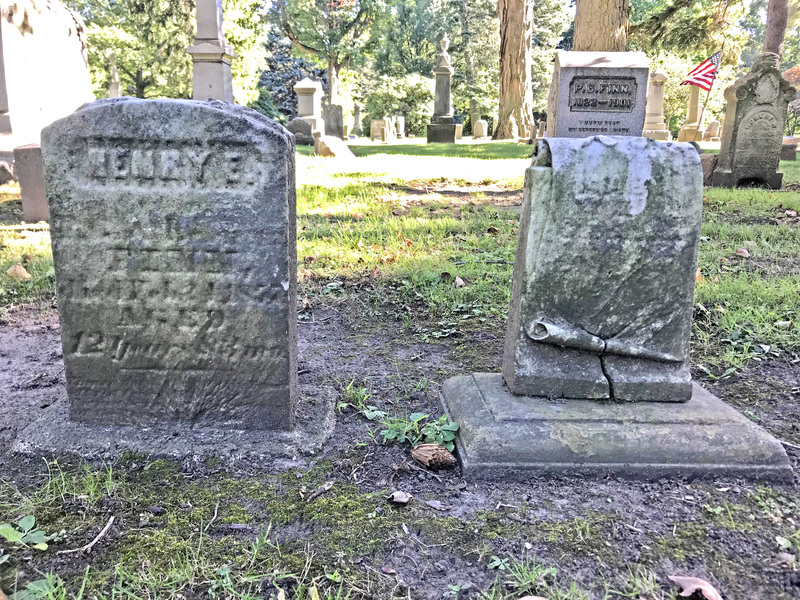 Laws were even passed to criminalize the vandalism of fences, trees, and shrubbery within cemetery grounds, which demonstrates the importance of these expanding graveyards to Pennsylvanians during this time. Today, one can visit the graves of those who helped build this city and those of just regular everyday people who were just trying to get by. There are myths to be explored — such as the Vampire Crypt with its mysterious "V" and supposed burn marks — and stories to be read, sometimes on the gravestones themselves. "They truly are outdoor museums," an article titled "Why Cemeteries Are Important" on Legacy, the leading online obituary website, reads. "Cemeteries are becoming destinations for photographers, for walkers and runners, for genealogists and historians." "Visiting your local cemetery can reveal the families who lent their names to the streets and neighborhoods in your town," explains Sarah Begley in her 2017 piece on cemeteries for Time Magazine. "[L]ooking at their groupings and ages can bring history to life." 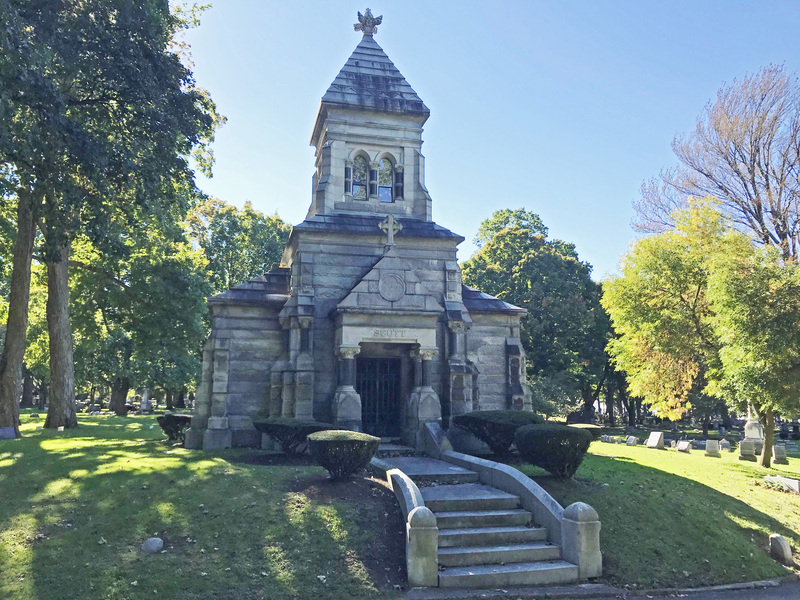 Erie Cemetery is open every day, all year during daylight. The office is open Monday through Friday 8 a.m. to 5 p.m. and on Saturday 9 a.m. to noon. Guests are encouraged and the association even offers a walking map for self-guided tours on their website: http://www.eriecemeteryassoc.com. As the leaves begin to turn and the air begins to cool, go enjoy a walk through the Erie Cemetery. Look around. Take in the history. Appreciate those who were here before us. You just might find afterwards that you appreciate our city a little more. Jonathan Burdick runs the historical blog Rust & Dirt. Follow them on Twitter @RustDirt, and on Instagram @RustandDirt. On April 16, join scientists and community leaders to learn how ongoing violations are affecting us all.